The past few months have been busy and rewarding at the World Cocoa Foundation. There are several significant events that we wanted to share with you. First of all, Nicko Debenham completed his term as WCF Chairman on May 16, and was recognized for his outstanding service to our organization at the International Indonesian Cocoa Conference in Bali, Indonesia co-hosted by Askindo and WCF. Nicko has helped our organization develop our monitoring and evaluation system. He was also instrumental in helping to develop our latest strategic five-year plan. 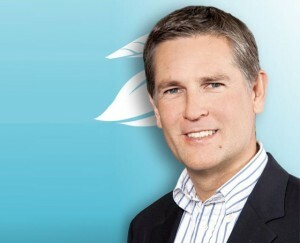 We are very pleased to welcome Barry Parkin as our new WCF Chairman. Barry is Chief Sustainability Officer at Mars Incorporated and has been one of the driving forces within our organization to develop a more focused, and coordinated strategy in West Africa. Barry, along with members of our Board of Directors, traveled to Côte d’Ivoire and Ghana this past week with WCF staff to unveil “CocoaAction” which is described later in this newsletter. WCF has also conducted Webinars and one-on-one calls with company members to better understand your company needs and updates, and to provide more details on CocoaAction and gain your feedback. Tim McCoy, Paul Macek, Holly Houston and I have greatly valued these discussions and thank the many company members who participated. We look forward to the second half of 2014, and hope that you will join us in Copenhagen for our next WCF Partnership Meeting. 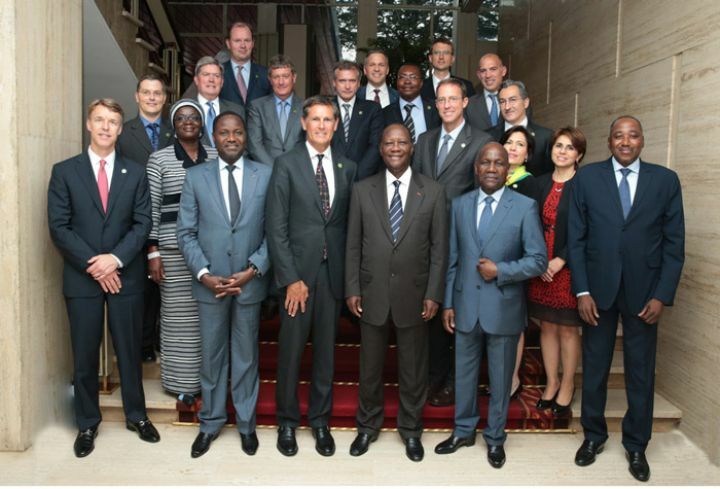 A group of WCF member companies signed a joint agreement with the Governments of Côte d’Ivoire and Ghana as part of an unprecedented strategy to accelerate actions to make cocoa farming in the country sustainable. The plan, known as CocoaAction, calls for building a rejuvenated and economically viable cocoa sector through increased cooperation between industry members and the governments. CocoaAction will later be extended to other cocoa-producing countries and is open to participation by others in the public and private sectors that support sustainability in the cocoa sector. Emphasis will be placed on providing cocoa farmers with a combination of productivity enhancements and community development interventions. These efforts are expected to reach no fewer than 200,000 Ivorian farmers and 100,000 Ghanaian farmers and the communities where they live by 2020. The strategy will be coordinated by WCF. CocoaAction was carefully and voluntarily developed by the companies in cooperation with the governments of Côte d’Ivoire and Ghana, the world’s top cocoa-producing countries. The two countries provide about 55 percent of the world’s current cocoa supply. Through CocoaAction, the companies will work closely with the Ivorian and Ghanaian governments and other national institutions to provide improved planting materials, fertilizer and training to cocoa farmers, while promoting community development through education, child labor monitoring and remediation, and activities to enhance gender empowerment. A series of indicators, currently being developed by WCF, will accompany the strategy and will allow companies and governments to measure and manage CocoaAction progress. Companies that have thus far voluntarily committed to CocoaAction include ADM; Armajaro; Barry Callebaut; Blommer Chocolate Company; Cargill; Ecom; Ferrero; The Hershey Company; Mars, Incorporated; Mondelēz International; Nestlé; and Olam International Ltd.
Read the FAQ document here. WCF has named Barry Parkin, chief sustainability officer at Mars, Incorporated, as its new Board of Directors chairman. He will complete the term of Nicko Debenham, who recently became the new vice-president of cocoa sustainability at Barry Callebaut. “I’m honored to accept this chairmanship and confident we can improve the lives of millions of farmers and the sustainability of cocoa by harnessing the collective influence and resources of the WCF membership,” says Parkin. As chief sustainability officer at Mars, Incorporated, Parkin is responsible for developing Mars’ sustainability programs across the value chain from farmers through to consumers. He works with the business unit’s sourcing teams to develop Mars’ corporate sourcing strategies across all raw materials and with the operational teams to build programs to make Mars’ operations sustainable in a generation. See the full list of WCF Officers here. The global sustainable cocoa community convened in Nusa Dua, Bali, Indonesia, on May 15-16 for the Sixth Indonesian International Cocoa Conference and 25th World Cocoa Foundation (WCF) Partnership Meeting. 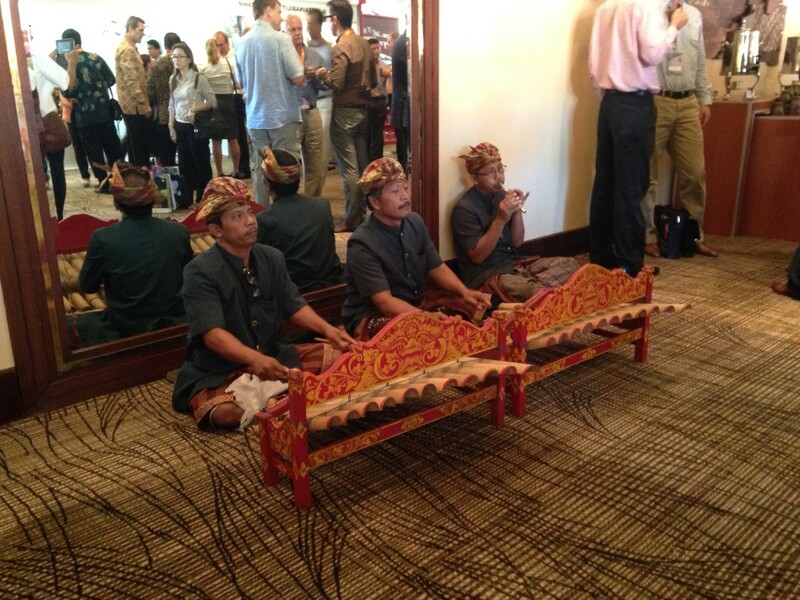 WCF co-hosted the meeting with the Indonesian Cocoa Association (ASKINDO) at the Westin Resort Nusa Dua, bringing together leaders in sustainability from across the cocoa supply chain in the third largest cocoa producing country. The event’s theme was “Empowering Smallholders for a Sustainable Cocoa Industry” with session topics including farm rehabilitation; cocoa market trends; sustainability and certification; emerging producers; emerging cocoa producers in Southeast Asia and the Pacific; South American cocoa sector developments; and financial management of cocoa farming. 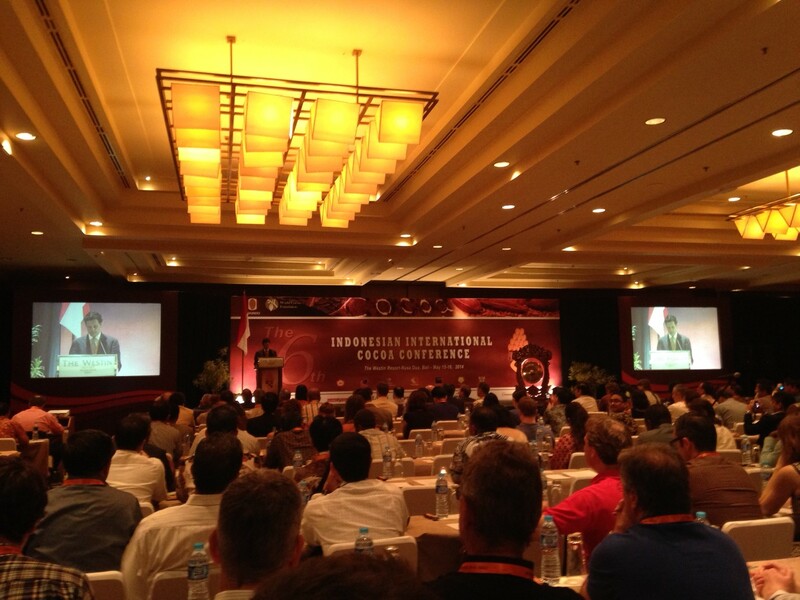 The conference drew in approximately 300 attendees from chocolate and cocoa industry, governments, NGOs, academia, and worldwide research institutes. Conference speakers featured top sustainability experts from cocoa companies, cocoa-producing country governments, and academia, including Muhammad Lutfi, Indonesian minister of trade; Suswono, Indonesian minister of agriculture; Frank Mars, president of Mars Symbioscience; Nicko Debenham, vice-president of cocoa sustainability at Barry Callebaut; Zulhefi Sikumbang, chairman of the Indonesian Cocoa Association; Gerry Manley, chairman of the Federation of Cocoa Commerce; Brandon Tay, chairman of the Cocoa Association of Asia; Jos de Loor, president of Cargill Cocoa & Chocolate; Christine McGrath, vice president of external affairs at Mondelēz International; Bill Guyton, WCF president; and Jean-Marc Anga, executive director of the International Cocoa Organization. Sponsors for the event included Barry Callebaut; BT Cocoa; Cargill; Guan Chong; Mars, Incorporated; Mondelēz International; Olam International Limited; Touton; and Transmar Group. The next WCF Partnership Meeting & Cocoa Sustainability Trade Fair will take place October 15-16 in Copenhagen, Denmark. More information available here. 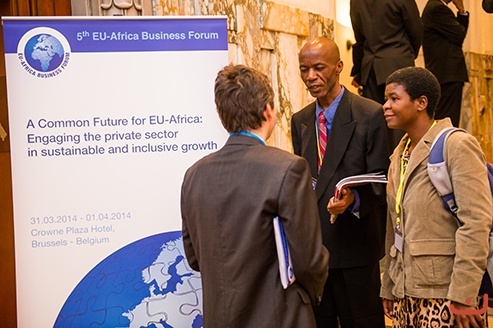 To promote sustainable and inclusive growth in both Africa and the EU, the European Commission organised the 5th EU-Africa Business Forum. The event brought together more than 500 high-level representatives from European and African business, politics and public institutions for two days of discussions March 31-April 1. WCF was one of the participants. Debates focused on common challenges such as the state of young people in today’s economies, the role of banks for inclusive growth and financing issues for Small and Medium Enterprises (SMEs), and on specific issues such as raw material, risk capital, sustainable energy or space cooperation. Prior to the forum, Commissioner Piebalgs also announced two new EU programmes to support the private sector in West Africa and Madagascar. Creating growth and job opportunity in Africa is crucial as this continent, as well as other developing regions, lacks employment and income generation opportunities, combined with a fast-growing, young population. In many developing countries, the expansion of the private sector, notably micro, small and medium-sized enterprises (MSMEs) are a powerful engine of economic growth and the main source of job creation. The private sector provides some 90 percent of jobs in developing countries, making it an essential partner in the fight against poverty. Yet, the private sector in Africa faces a formidable range of obstacles compared to their rivals in other emerging markets: widespread and rising informality, a “missing middle” in the size of enterprises and little upward mobility, weak inter-firm linkages, lack of export competitiveness, lack of innovation capabilities, complexity of registering business and taxation, infrastructure shortages, a spluttering electricity supply, limited access to finance and corruption. Other areas of support include the promotion of investment and co-operation activities among businesses, and the facilitation of access to financial markets. An important focus is also put on support for microfinance and financial inclusion. The African continent receives approximately 50 percent of overall EU direct support to Private Sector Development in developing countries. Between 2004 and 2010, €1.2 billion was allocated to Africa (including Sub-Saharan Africa and Northern Africa). Developing a viable and vibrant agriculture sector in Africa presents a significant market opportunity for companies, especially small and family farmers, who are the largest private investors in African agriculture. Further integration into the agricultural economy provides the possibility for rural and urban farming households, as well as agribusinesses, to earn a living to increase wealth and prosperity. The World Bank estimates that by 2030 the total volume of agriculture and agribusiness will be $1 trillion, from $313 billion in 2010. If countries and regions within Africa manage to build a competitive agri-business sector, the agricultural sector could play a major role in economic transformation. This will create jobs and provide income to people – mostly in rural areas, but also in urban areas. Since the EU is embarking on a new planning cycle (2014-2020) for assistance to African countries possibilities for cooperation with the EU will be explored. Through the Cocoa Livelihoods Program (CLP) Phase I, the World Cocoa Foundation developed thirteen business service centers (BSC) in Ghana, Côte d’Ivoire and Cameroon in order to deliver extension and business advisory services, provide training in farm management and good agriculture practices, and help farmers’ access productive inputs and other support services. 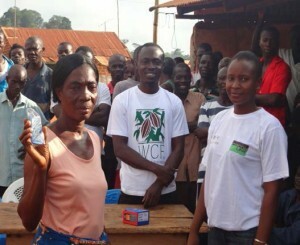 BSCs in Ghana are now providing a weekly radio extension program, which has reached 14,000 farmers, as well as farm mapping support services in partnership with the Peace Corps. One of the farmers benefitting from these services includes Ernest Twum, who produces cocoa on a 5.5-acre farm in New Edubiase, Ghana. Normally he would purchase fertilizers and other spraying chemicals, costing a total of 1,308 GHC ($545). After hearing about the BSC farm mapping initiative from the radio program, he worked with a locally trained BSC mapping assistant to measure his farm with a GPS handheld receiver. The GPS measurement revealed that Ernest’s farm was actually 3.2 acres and not 5.5, which meant Ernest had been over paying and applying fertilizers and other chemicals on his farm. In addition, the laborers he hired to weed and spray his farm charged him a fee based on a five-acre plot. Now that Ernest knows the actual size of his plot, he intends to buy less fertilizer for his farm in the 2014 season through the BSC input credit scheme resulting in savings of 518 GHC ($215). He has recommended this mapping exercise to other farmers who describe it as an “eye opener” as they had no knowledge of their land size to help them make farm business decisions such as the appropriate quantities of inputs to apply. By the end of CLP Phase I, the initiative mapped over 600 farms covering more than 1,600 acres. In 2011, WCF, with initial support from the Hershey Company, set out to provide a low-cost method to enhance cocoa farmer training services. 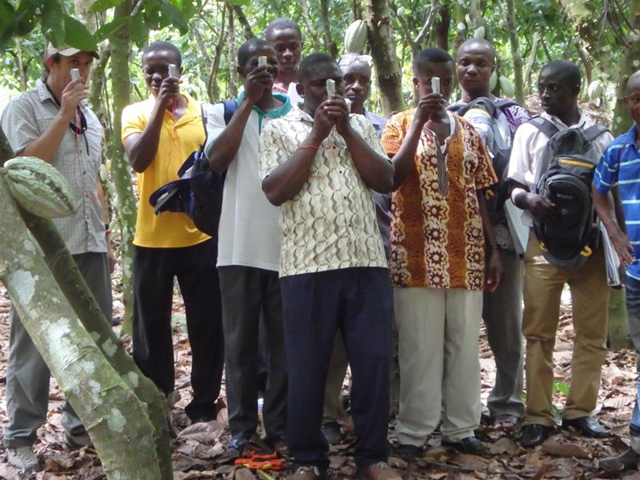 In coordination with the Ghana Cocoa Marketing Board (COCOBOD), a mobile telephone based communication system called CocoaLink was developed for Ghanaian cocoa farmers. CocoaLink has since proven to be an effective way of sharing agricultural and social practices with farmers and to help improve their incomes through increased cocoa productivity. Early, and ongoing, government engagement is vital. Contributions and leadership from COCOBOD and other government agencies has been invaluable to the success of CocoaLink. The partnerships draw on established government structures and their trusted relationships with farmers. By including other diverse partners, such as cocoa industry and telecom companies, robust farmer-focused systems are developed. A transition plan for post-pilot management needs to be articulated early. CocoaLink was designed to be transferred to COCOBOD at the end of the three-year pilot. However, transition processes are better integrated into the entire project plan from the beginning. Additionally, at least six-months of post-transition support ensures smooth operations as it fully transitions. Practical messages must be carefully crafted. Messages must be clear and understandable to an audience whose literacy may be minimal. Effort is required to make messages concise, while still containing all the relevant information that conforms to the words and syntax that farmers utilize on a daily basis. CocoaLink messages therefore mirror the cocoa growing calendar and are reviewed by an expert Editorial Committee. 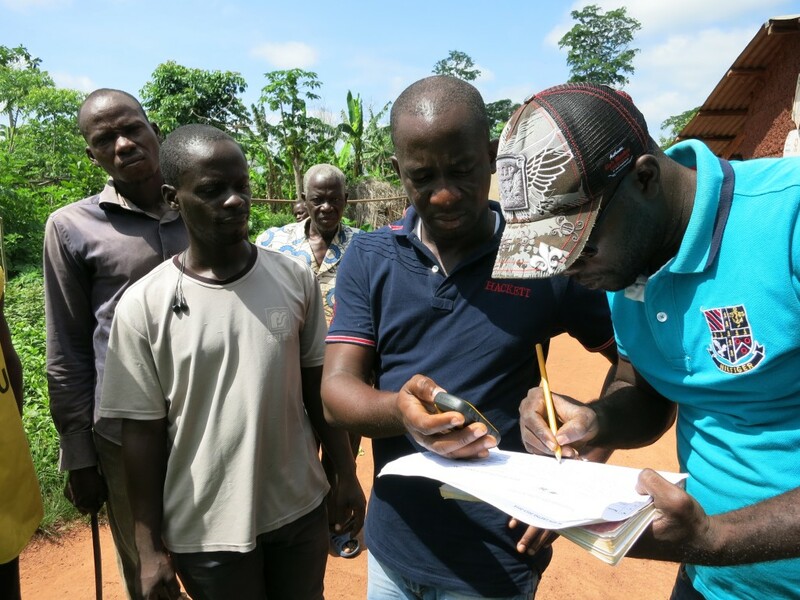 This system helps ensure that the challenges faced by cocoa farmers are addressed in the messages. Flexibility towards technological advancements ensures constant utility and cost efficiency. Technology should be harnessed to support a continuous increase in the numbers of farmers using the system to ensure that any farmer can use the system. Additionally, the higher the number of farmers enrolling in the system, the lower cost per message. M&E is critical to the success of the program. The monitoring and reporting system of CocoaLink includes a mobile Smartphone registration app to enroll farmers in the system. It has the power to collect information about farmer needs that can support extension agents to better serve them towards increasing productivity and income. 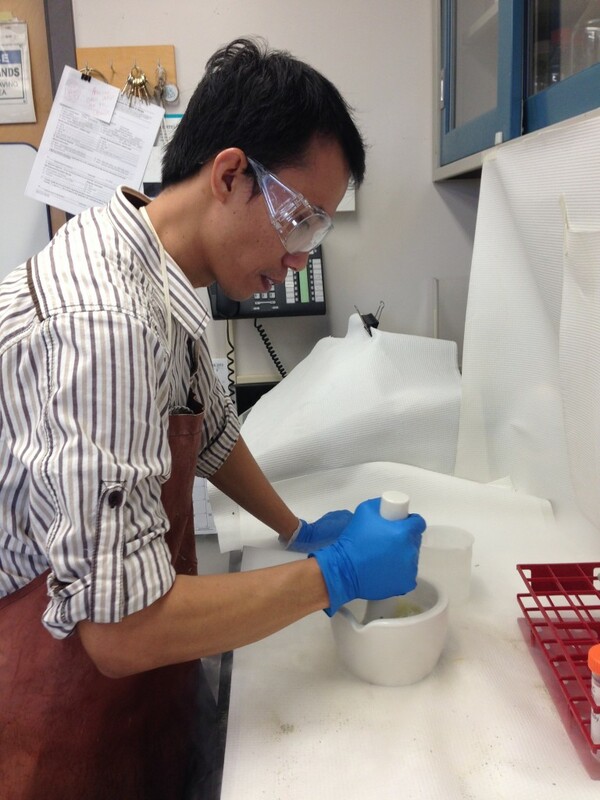 Asman Asman is a 2014 WCF-USDA Cocoa Borlaug fellow from Indonesia, and is currently researching Vascular Streak Dieback (VSD) at the United States Department of Agriculture – Agricultural Research Service (USDA-ARS) laboratory in Maryland. With more than nine years of experience in cacao, Asman was an assistant researcher for Cocoa Research Group (CRG) at Hasanuddin University in Makassar, Indonesia before he applied and received a Borlaug fellowship. Asman received two degrees from Hasanuddin University. He holds a bachelors in plant pests and diseases and a masters in farming systems – plant pests and diseases. In 2005, Asman began researching VSD when he worked at Mars, Incorporated as a field research contractor on their research farm. In his various studies, Asman researched the abundance of microbes in cacao tissue, the role of microbes in cacao tissue in relation to VSD, and the potential role of microbes in forming a clone resistant to VSD. During his fellowship, Asman will further research microbes, isolating microbes from cocoa twigs into the categories: resistant to VSD, healthy but susceptible and diseased. He will extract DNA and RNA from infected tissue and sequence the RNA to identify the transcriptome of the pathogen causing the disease. At Hasanuddin University, Asman worked with former Borlaug alumni, Muhammad Junaid, who also completed his fellowship at USDA-ARS researching VSD. Junaid was featured on Voice of America Indonesia during this fellowship, and he also published an influential research paper on VSD, with his Borlaug mentor at the time. “The Cocoa Borlaug Fellowship program enables me to research under the supervision of a plant pathologist expert, have access to well-equipped laboratories, training, and cocoa industry conferences. I am learning various new approaches and techniques to find out more about VSD disease,” Asman said. Asman will complete his fellowship in June, when he will have visited various chocolate companies and cocoa warehouses. Asman also attended the Pennsylvania Manufacturing Confectioners’ Association (PMCA) conference in April. WCF, the World Bank, International Finance Corporation (IFC), and the Forum for Agricultural Risk Management in Development (FARMD), hosted a webinar on March 25 entitled, “Cocoa Sector Development in Latin America and the Caribbean: Challenges, Risks and Roles of the Public and Private Sector.” More than 75 people participated via webinar, including government representatives from the Dominican Republic, Guatemala, Peru, Colombia, Mexico and Ecuador, and members of the cocoa industry and non-governmental organizations. Roberto Granja of Transmar Group began the webinar by discussing the situation and perspectives of the global cocoa market. Granja covered certified and uncertified cocoa, and discussed their challenges, and highlighted private sector, governments and banks as forces for sustainability. Granja concluded that the annual growth of cocoa in the region, especially Ecuador, is ideal for the industry in order to meet consumers’ increased demands in the coming years. In the presentation by the World Bank, Luz Diaz Rios, Juan Gonzalo Flores, and Robert Peck elaborated on Granja’s presentation, discussing cocoa in relation to the environment and the producer. Diaz Rios emphasized the need for diversification of the system, such as with crops, agro-forestry, and market strategy, to empower the farmer. Improving climate resilience, biodiversity, and adopting new technologies were mentioned as essential to the sector, with a need for public and private mediators to provide services, coordinate the value chain, and facilitate new methods for increased production. Peck discussed the various opportunities in the region from the government and private sector. Though the region continues to show growth potential, Flores concluded that financial and credit opportunities exist and should continue development. Bernardo Saenz of Consejo Nacional Cacaotero de Colombia explained the cocoa value chain to participants. He discussed how to assess the value chain to create a common vision for the future of its competitiveness and varied interests. With an integrated approach, Saenz explained that national production can increase, and economic, social and environmental sustainability can develop. In order to build Colombia into a global market player of fine flavor chocolate, a plan of action including technological consolidation, diversification, new actors and markets, extension services, and more, were emphasized. The webinar concluded with a question and answer session which gave participants an opportunity to further investigate some of their interests or concerns brought up during the presentations. At the close, positive feedback was given from various participants, including farmer groups, university actors, and government representatives. “Excellent initiative of the organizers. We hope they repeat it again with more countries and new experiments,” Manuel Montilla, Ministry of Agriculture, Dominican Republic, said. The CocoaMAP Initiative is rooted in an ongoing conversation about ‘measuring what matters’ in the cocoa value chain. Leaders in the cocoa sector have joined in this conversation to share their priorities and establish a vision that has led to the creation of the CocoaMAP Key Performance Indicators (KPIs). 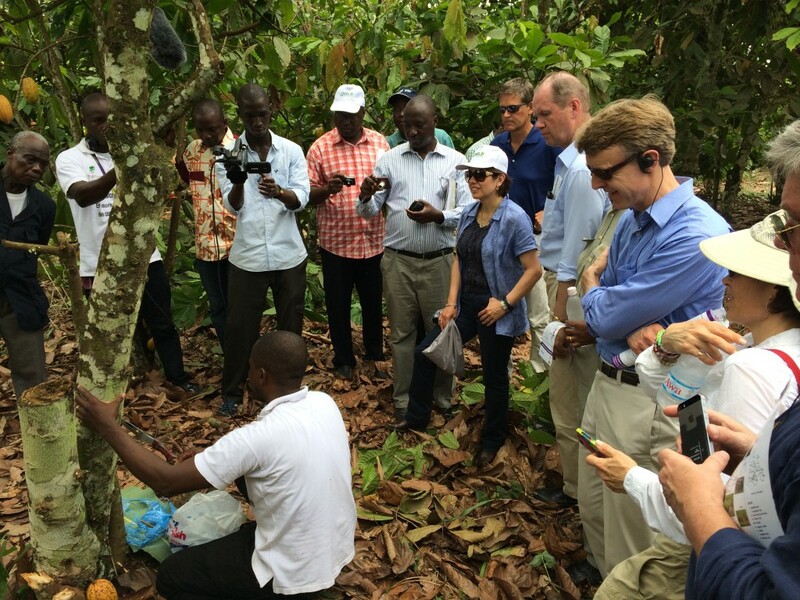 While this discussion began with the recognition that credible shared data on cocoa sustainability was needed and was too often lacking, a lesson learned along the way was that improved and efficient methods for collecting farm-level data was also needed by many private and public organizations working in cocoa. Without well-documented and shared methods, we may not attain the information we need to support more sustainable farm economies and communities. With these needs in mind, WCF began in 2013 to develop a set of data collection tools for use with the CocoaMAP KPIs. This work started by developing methods to assess biodiversity and environmental health on cocoa farms in West Africa. These simple field tools, enabling surveyors to assess several environmental indicators during the one site visit, have come to be known as the CocoaMAP FIT, or “Farm Information Toolkit”. In 2014, the CocoaMAP Farm Information Tool Kit is being expanded to become truly worthy of its name. FIT methods and tools currently in development will capture farm characteristics including farm size, composition, productivity, and cocoa yield, as well as farmers’ use of Good Agricultural Practices (GAPs), farm ownership, household make-up, and socio-economic indicators. Today, and through September 2014, WCF is at work testing and refining CocoaMAP FIT in Ghana and Côte d’Ivoire. 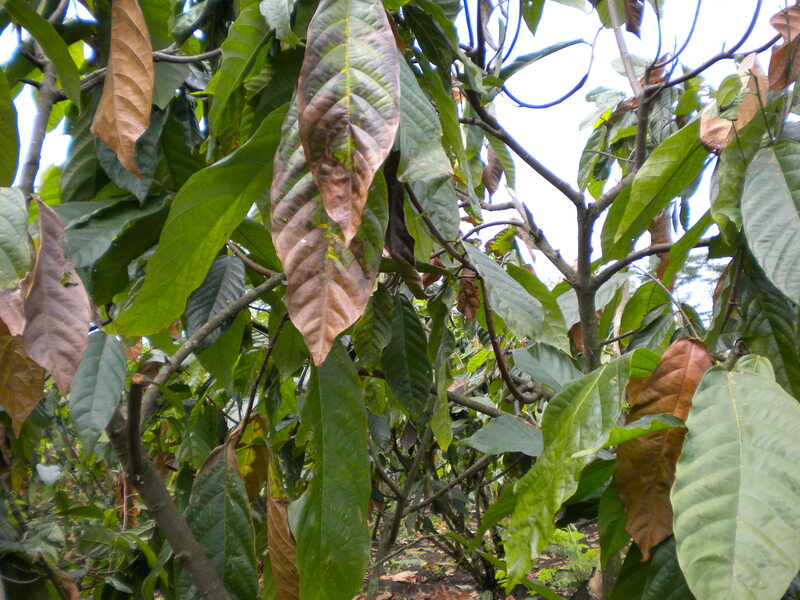 At summer’s end, WCF will invite member company staff to pilot test this toolkit on cocoa farms, whereupon these methods and tools can be integrated into companies’ supply chain management practices and government extension workers’ trainings. In the end, our goal in improving data collection is to help leverage the work of many partners to track crucial trends on sustainability of farms and farming communities. With improved information in hand, CocoaMAP holds the promise of sharing knowledge that leads to improved farm sustainability and supply-chain management across the cocoa sector, delivering strategic value to businesses working to improve the cocoa value chain. And, with improved information in hand, the CocoaMAP Online Dashboard will go live in 2015 to distribute this knowledge over the world wide web. Reaching from the farm to the Internet cloud, the CocoaMAP Initiative is making progress – refining farm data collection on the ground in West Africa, while simultaneously leveraging the Internet to distribute improved information across the globe. This event showcased the learning that the BACP has collected from the organizations funded by IFC under this program in 2013. The learning and sharing event invited an audience of representatives from public institutions including the GEF, World Bank and IFC, as well as experts in cocoa, soy and palm oil. Download IFC’s discussion paper related to this event Transforming Markets for Conservation here. 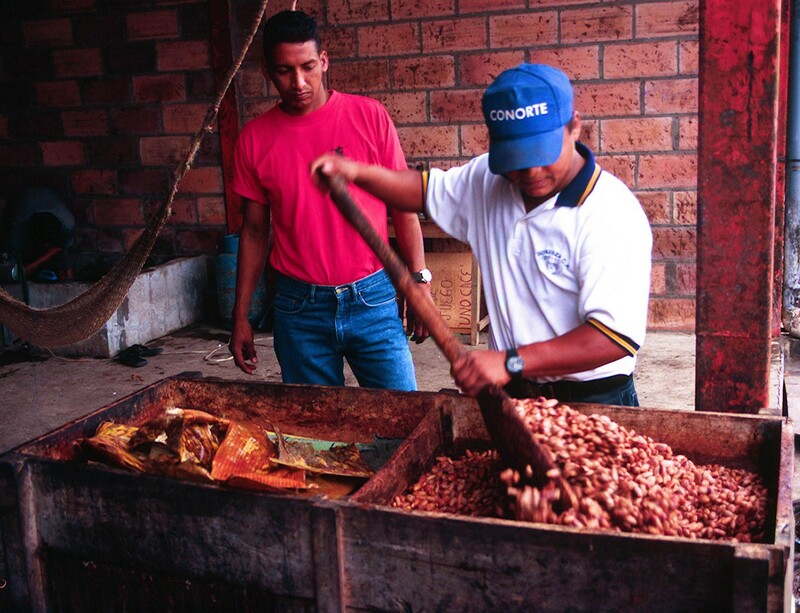 IFC’s new sustainability magazine recently featured WCF President, Bill Guyton, and Business Manager, Cocoa Measurement and Progress Initiative, Steve Farone, on sustainability, collaboration and the future of the cocoa sector. We congratulate retiring WCF staff member Charlie Feezel (WCF/Education Program Director) and thank him for his many years of service. We also extend our best wishes to departing staff members Holly Houston (WCF/Director of Operations and Finance) and Katie Denman (Office and Special Events Coordinator), as they take the next steps in their career paths. WCF welcomes new staff members Suzanne Ngo-Eyok (Program Director, WCF/CLP – Accra), Dieu-ne-Dort Njankoua Wandji (Country Coordinator, WCF/CLP – Abidjan), and Vincent Manu (Country Coordinator, WCF/CLP – Accra).